The Brown Recluse Spider (Loxosceles reclusa) is also known as the violin spider or a fiddleback because of the violin-shaped markings they often have on their thorax. They are known to live in United States of America, Mexico and Canada. In Canada they are known to live southeast Ontario and southern parts of Quebec. They are typically light to medium brown but can range in colour from cream to dark brown or blackish gray. 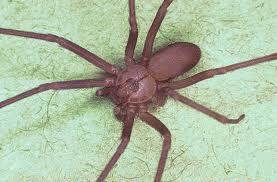 Brown Recluse spiders are relatively small and are usually between 6-20 mm however they can grow larger. They have no obvious colouration patterns on their abdomens or legs and their legs also lack spines and their abdomens are covered in a fine short hair that gives the appearance of soft fur. Unlike many other species of spiders, brown recluse spiders only have six eyes instead of eight. Their eyes are arranged in pairs with one median pair and two lateral pairs. Adult brown recluse spiders live for about 1-2 years and in their lifetime an adult brown recluse will produce several egg sacs over a period of 2-3 months from May to July with each sac holding about 50 eggs. The eggs will then hatch in about a month and the spiderlings will reach adulthood in about a year. Brown recluse spiders are resilient spiders and they can tolerate up to 6 months of extreme drought and scarce food. They will build irregular webs that frequently include a shelter the consists of disorderly threads and they will also usually build their webs in places such as woodpiles, sheds, garages, cellars and other places that are dry and generally undisturbed. If you are seeing spiders of any sort – and more importantly webs – on your home, cottage, storefront, or signs, give Cottage Country Pest Control a call at (705)534-7863 or email us Ross will be happy to help. This entry was posted in Brown Recluse, Integrated Pest Management, Pests, Spiders and tagged barrie, honey harbour, huronia, huronia pest control, integrated pest management, IPM, midland, muskoka, orillia, penetang, penetanguishene, pest, pest control, pests, port mcnicholl, port severn, simcoe, spider spray, spider sprays, spiders, spring, tay, tiny, victoria harbour by Tamara Batryn. Bookmark the permalink.